Using glass rods to make fused glass jewelry and other art glass objects. Rods were originally developed for use by glass bead makers, using a flame the hot glass is wound onto a mandrel to form a bead. 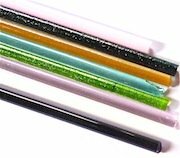 Both Bullseye Glass and System 96 supply rods in a wide range of colors for use in glass fusing projects, due to compatibility problems rods from these companies are not interchangeable. These rods are about 1/4" thick x about 17 inches long. They can be purchased individually or in bulk amounts. The rods are easily cut using a mosaic tile nipper. They can be cut into lengths or nipped into small pieces. It is quite easy to use sections of rod in fused glass jewelry pieces as they fuse very easily with other pieces of glass. By using very small nipped pieces, it is possible to obtain a small dot effect in fused glass. Placement can be a problem at times, as the pieces of rod will sometimes roll out of position. Use a small amount of glue to secure the rod in place. If you have a glass grinder, you can grind a flat section on the rod and then place it into your jewelry piece. There are some lustre rods produced by Bullseye Glass, which are not suitable for kiln forming. Lustre rods form only a minute amount of rods available for kiln forming. Jewelry items containing pieces rod of are just fused normally in a fusing kiln. As a design, feature rod pieces can be contour fused for added effect. Larger fused glass items can also have fused rods in the design with some items being made completely from fused art glass rods. There are also large supplies of COE 104 rods on the market, largely used for glass bead making. COE 104 rods cannot be fused with COE 90 or COE 96 glass for the reasons listed in the compatibility problems above.